Volunteers get a briefing on Thursday at the George Brown Convention Center that has been turned into a shelter run by the American Red Cross to house victims of the high water from Hurricane Harvey in Houston, Texas. A Thursday Morning Edition interview with a Red Cross official and its companion online story (posted late Wednesday night) have prompted an outpouring of complaints to my office and NPR and on social media. Online, that translated into this headline: "Red Cross Exec Doesn't Know What Portion Of Donations Go To Harvey Relief." "Chang was interviewing the VP of disaster operations and logistics. He clearly stated that the Chief Fundraising Officer would be the person with those figures. 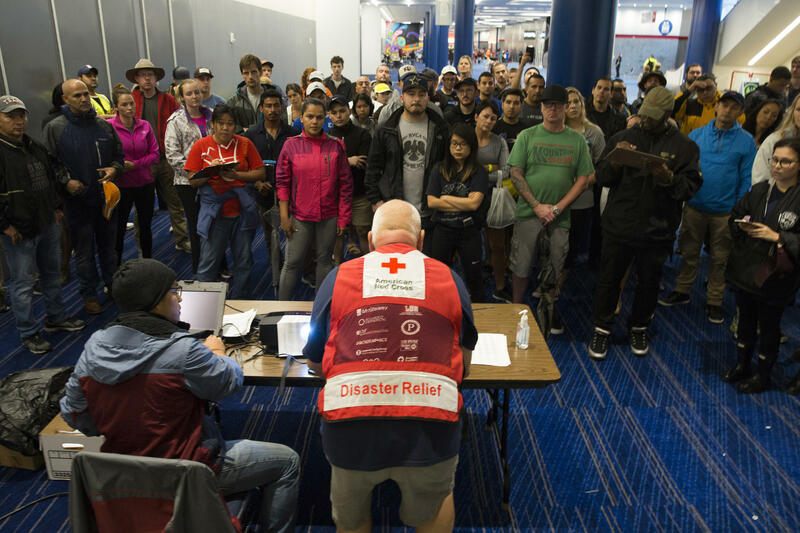 Perhaps the Red Cross should have made the fundraising officer available for an interview, or perhaps NPR should have made that request, but it's entirely reasonable to not expect the logistics VP to know those numbers. Calling it out in this post/recap/story falsely implies that Kieserman SHOULD know what portion of donations go to Harvey relief. Instead of making that post, NPR should call the Chief Fundraising Officer and ask THEM that question. If that person doesn't know the answer, THEN it's a story." Some listeners were unhappy at the tone of Thursday's interview at a time when disaster relief efforts are ongoing. I'd argue that such questions are entirely appropriate and even crucial at this time, when many are trying to decide where best to channel their donations to those in need of help. Still, the confusion of listeners and readers was understandable, since NPR left out the background of how the interview came about, including why it was asking Kieserman, not another official, about the accounting. Here's what was left out: Newsroom officials told me that NPR this week requested an interview with Red Cross President and Chief Executive Gail J. McGovern. Similar requests have been made several times in recent years and were always turned down. This week, NPR said, "The organization said McGovern was unavailable, but did make Kieserman available." Christopher Turpin, NPR's vice president of news programming and operations, told me, "NPR will continue to seek an interview with Ms. McGovern at her convenience."